^ 1.0 1.1 1.2 1.3 1.4 Laoust, H., "Ibn Abd al-Wahhāb", in: Encyclopaedia of Islam, Second Edition, Edited by: P. Bearman, Th. Bianquis, C.E. Bosworth, E. van Donzel, W.P. Heinrichs. ^ Moosa, Ebrahim. What Is a Madrasa?. UNC Press Books. 2015-04-06: 97. ISBN 9781469620145 （英语）. ^ White, Jonathan R. Terrorism and Homeland Security. Cengage Learning. 2016-01-01: 252. ISBN 9781305886940 （英语）. ^ Hubbard, Ben. A Saudi Morals Enforcer Called for a More Liberal Islam. Then the Death Threats Began.. The New York Times. 2016-07-10 [2016-12-16]. ISSN 0362-4331. ^ Asad, Talal. Formations of the Secular: Christianity, Islam, Modernity. Stanford University Press. 2003-02-03: 222. ISBN 9780804747684 （英语）. ^ ́goston, Ga ́bor A.; Masters, Bruce Alan. Encyclopedia of the Ottoman Empire. Infobase Publishing. 2010-05-21: 260. ISBN 9781438110257 （英语）. ^ 7.0 7.1 7.2 7.3 Heern, Zackery M. The Emergence of Modern Shi'ism: Islamic Reform in Iraq and Iran. Oneworld Publications. 2015: 133–134. ISBN 9781780744971. ^ Nawaf E. Obaid. The Power of Saudi Arabia's Islamic Leaders. Middle East Quarterly. September 1999, VI (3): 51–58 [23 June 2011]. （原始内容存档于6 August 2011）. ^ 14.0 14.1 14.2 The Life Account of Shaykh Ibn ‘Abd al-Wahhab and Ibn Sa‘ud. [2018-12-09]. 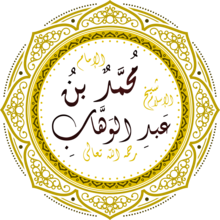 ^ 17.0 17.1 17.2 17.3 Shahi, Afshin. The Politics of Truth Management in Saudi Arabia. Routledge. 2013-12-04: 46. ISBN 9781134653195 （英语）. ^ Abu.Iyaad. The Genealogy of Shaykh Muhammad Bin Abd Al-Wahhaab. [2018-12-05]. ^ Rapoport, Yossef; Ahmed, Shahab (2010-01-01). Ibn Taymiyya and His Times. Oxford University Press. p. 305. ^ Ibn Hajar al-Haythami: "Make sure you do not listen to what is in the books of Ibn Taymiyya and his student Ibn Qayyim al-Jawziyya and other such people who have taken their own whim as their God, and who have been led astray by God, and whose hearts and ears have been sealed, and whose eyes have been covered by Him... May God forsake the one who follows them, and purify the earth of their likes" (in Rapoport, Yossef; Ahmed, Shahab (2010-01-01). Ibn Taymiyya and His Times. Oxford University Press. p. 274. ^ Ibn Hajar al-Haythami: "Ibn Taymiyya is a servant whom God has forsaken, led astray, made blind and deaf, and degraded. Such is the explicit verdict of the leading scholars who have exposed the rottenness of his ways and the errors of his statements" (in Rapoport, Yossef; Ahmed, Shahab (2010-01-01). Ibn Taymiyya and His Times. Oxford University Press. p. 271. ^ Islamic Law and Society. E.J. Brill. 2006-01-01: 216 （英语）. ^ Parker T. Hart. Saudi Arabia and the United States: Birth of a Security Partnership. Indiana University Press. 1998: 7. ISBN 0-253-33460-8. ^ Sebastian Maisel; John A. Shoup. Saudi Arabia and the Gulf Arab States Today: An Encyclopedia of Life in the Arab States. Greenwood Press. February 2009: 228. ISBN 978-0-313-34442-8. ^ Hunt Janin; André Kahlmeyer. Islamic Law: The Sharia from Muhammad's Time to the Present. McFarland. 22 February 2007: 92. ISBN 978-1-4766-0881-5. ^ 50.0 50.1 50.2 Khatab, Sayed. Understanding Islamic Fundamentalism: The Theological and Ideological Basis of Al-Qa'ida's Political Tactics. Oxford University Press. 2011: 73–74. ISBN 9789774164996. ^ Vassiliev, Alexei. The History of Saudi Arabia. Saqi. 2013. ISBN 9780863567797.